It is the time of year again where everyone is making resolutions about how they wish to change their life for the new year. I’m all about the “New Year, New Me,” but I’m one of many people who have issues keeping their resolutions. I’m hoping if I make a public declaration of my writing resolutions, I will chose to keep them out of fear of embarrassment. 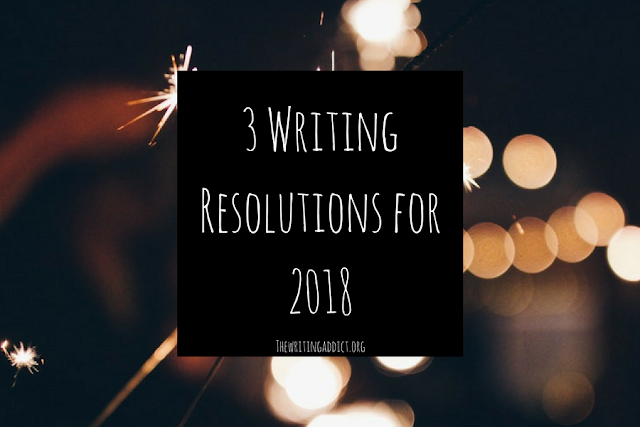 Without further ado, I present my three writing resolutions for 2018. 1. Write one blog post every week for the year of 2018. One of my major goals of the year is to commit to weekly schedule with this blog. I have a tendency to lose inspiration and procrastinate, so I’m afraid of committing to this resolution. However, I have always wanted to have an active blog that I could be proud of. I took the first step by buying my domain. Now, it is just time to fill the world with my writing content! I think every writer experiences the fear that their work will never be finished or perfect enough to submit for publication. My dream has always been to be a published author and I am determined to make that possible in 2018. The only way to be published is by actually sending work out to be reviewed. Therefore, I must let go of my fear and generate content. 3. Commit to my writer’s heart. I touched on this in my “Why I Failed NanNoWrimo 2017” post, but I want to make a resolution this year to commit to my own writing truths, rather than being concerned about what is popular. I’m always questioning whether I’m writing the correct thing to achieve my dream of becoming published, but I must ground myself and realize that what I write is art. Not all art is recognized at first for its greatness. As long as I can remain true to myself, that is what truly matters. Thank you all for sticking with my wishy-washy self in 2017. I hope to make 2018, one of the best years ever on The Writing Addict and in my own writing life. Cheers to the new year! I can’t wait to see where it takes you and me. Have you made any resolutions this year? Comment them below!